Though the match reports will all focus on England making it three form three in the 2013 Six Nations Twickenham yesterday hosted two internationals. After the men’s game the French Women secured an impressive 30-20 victory against the home team who could not match the physical approach of the French. 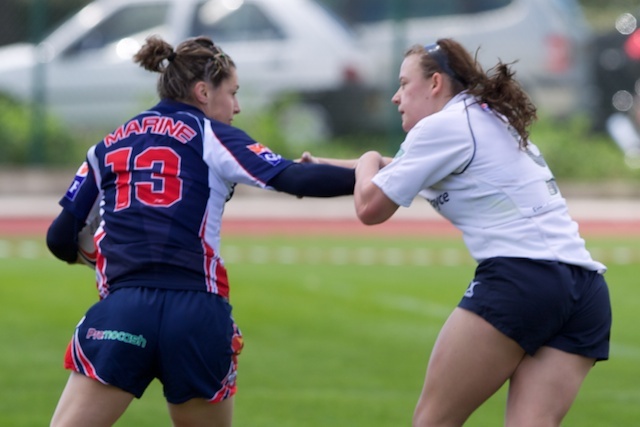 France’s final try was scored by their fullback Carloine Ladagnous who showed the pace and balanced running that the Navy Women had encountered last season at Toulon. There when playing at outside centre she had shown her obvious class as she again and again posed the Navy defence all sorts of problems. 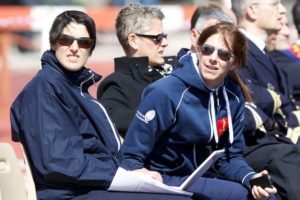 Fiona Simoneau-Byrne, Team Manager for Marine Nationale (F) keeps trying to convince all who will listen that her team is in a rebuilding phase. Her two International stars suggest that some solid foundations are in place. On the touchline (and on crutches) at Toulon was the Marine Nationale’s number 8 Sandra Rabier who yesterday was moved to lock and was part of a very physical french pack that proved difficult for England to contain. 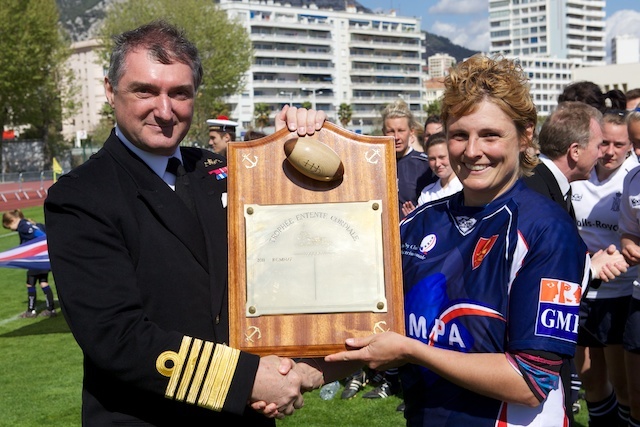 Despite the continued claims from across the channel that the french navy are rebuilding their women’s team following a very successful period it would seem that they will still have the ability to call on some first class players when they travel to Portsmouth (3 April) and seek to retain their trophy. Before then followers of Navy Rugby will be able to see the Navy Women in action when they play their Trojans on 6 Mar at Portsmouth. This will be the teams final match before they face the french. Though in Toulon they lost the initiative very early on they will have been heartened that they caused a few problems of their own when the took the game to Marine Nationale (F) through some strong running from their forwards. I think more of the same will be required this year. 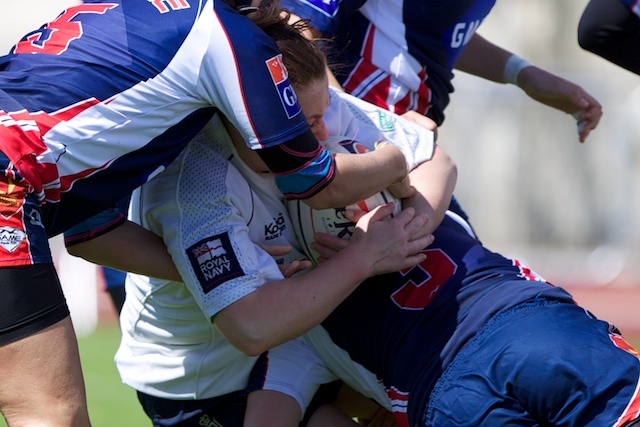 With the French backline running free it was the Navy pack that showed that they could cause some problems of their own when the took the direct approach through their strong ball carriers like Helen Reach. 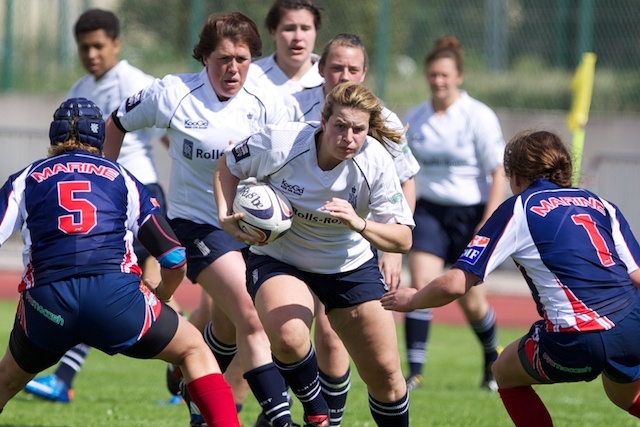 15:00 Wednesday 3 April 2013 – Royal Navy Women v Marine National Feminine @ Portsmouth for the Trophy Entente Cordial followed by Le Crunch – Royal Navy v Marine Nationale @ 19:00 A great day of rugby to mark in your diary. Un accueil chaleureux vous attend pour nos amis de la France jusqu’a ce que l’arbitre commence Le Crunch et aussi le match pour Le Trophee Entente Cordial. Merci pour ce bel article Geraint. Nous sommes fiers de nos deux marinettes de Twickenham en effet. Mais nous ne sommes pas encore certains qu’elles seront avec nous à Portsmouth. Et même dans ce csa, Fiona is rigbht our W team will be less strong than the two past years and I think that your girls will be able to make a thousand of problems to our team. Encore merci et nous sommes heureux à l’idée de nous réunir une fois encore à Portsmouth dans un mois.